1. The reason I ended up in Finland is… I was determined to leave my home country because it didn’t feel comfortable living there and I was trying to find a place to study abroad. At first, I was looking at London, but circumstances pushed me towards the Nordics, I got accepted into TaiK (an arts university in Finland) and I moved to the country of thousands of lakes. 2. What I find surprising about working in Finland is… the work-life balance, which everyone respects here. Try moving to any other non-Nordic country and you’ll most likely find a work regime that means your evening sports/yoga/pole dancing class is out of question. 3. 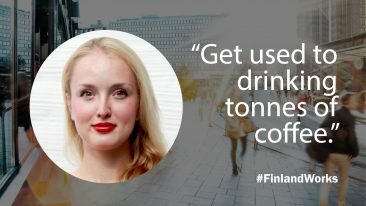 If I could change one thing about Finnish working life it would be… working towards making working life more approachable, inclusive for foreigners. It’d do a lot of positive things for both the company and its people. 4. How I got my current job is… I opened Gmail and sent my future employer a letter explaining what I want in my professional life and what I can offer in return. It happened to be a match. 5. The piece of advice I would give to someone contemplating coming to work in Finland is… having the full month of July for vacations sounds crazy only for the first few years. Then it becomes a norm, almost like a pizza with pineapple.